A recent study of over 50,000 smartphones has concluded that Apple's iPhone has the fewest malfunctions, but is particularly at risk to accidental drop-related damage. Third-party warranty provider SquareTrade analyzed data from more than 50,000 smartphones covered by its warranty plans. Among the smartphones included in the study were the iPhone 4 and iPhone 3GS from Apple; the Droid, Droid X, Cliq from Motorola; the Nexus One, Evo, Droid Incredible from HTC; and the BlackBerry Curve, Bold, Storm from Research in Motion. Handsets from other manufacturers, such as Samsung, LG, Palm, Nokia and Sony-Ericsson were also included. The study found that the iPhone 4 was the most reliable phone of the group with just 2.1 percent of owners projected to have a non-accident malfunction in the first 12 months. The iPhone 3GS and Motorola came in just behind the iPhone 4 tied at 2.3 percent. Though the iPhone 4 performed well with regard to reliability, it also appeared to be more accident-prone. Apple's newest smartphone is projected to have the highest accidental damage rate after 12 months: 13.8 percent. According to the study, the iPhone 4 has a higher rate of drop damage than other smartphones, possibly due to the iPhone 4's two sides of glass. "The data seems to suggest that the likelihood of drop damage is directly proportional to the amount of glass on the device," the report noted. As the main cause of accidents, drops make up 77 percent of accident claims, according to the report. 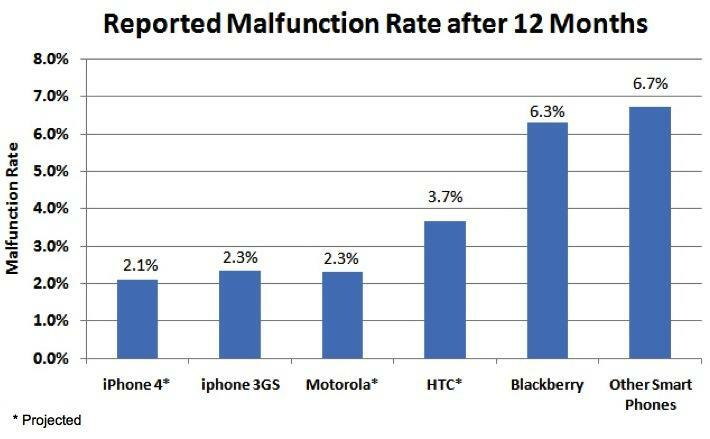 In more good news for Apple, the iPhone 3GS had the lowest overall failure rates, which included malfunctions and accidents. Just 11.8 percent of iPhone 3GS owners reported a failure in the first 12 months of use. 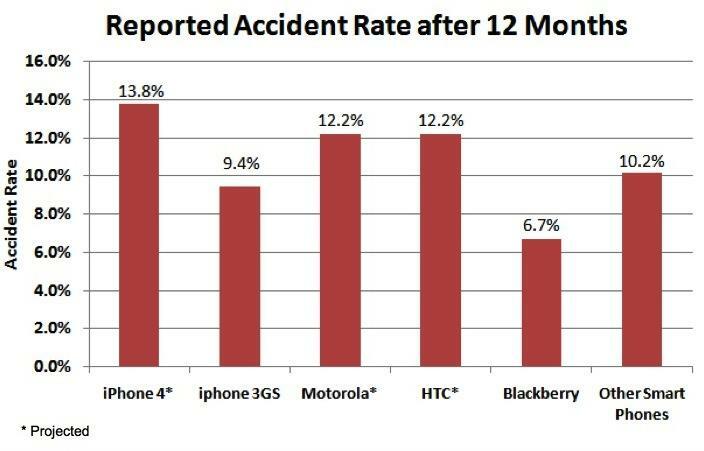 BlackBerry devices posted a higher malfunction rate of 6.3 percent after 12 months, but made up for it with a lower than average accident rate of 6.7 percent. Android phones from HTC and Motorola had a matching accident rate of 12.2 percent, although Motorola's malfunction rate of 2.3 percent bested HTC's rate of 3.7 percent. Overall, smartphone reliability has improved significantly since SquareTrade's 2008 Cell Phone Comparison Study. For example, Apple has cut its malfunction rates for the iPhone by roughly 60 percent since 2008. In October, SquareTrade reported that iPhone 4 owners were submitting accident claims 68 percent more often than iPhone 3GS owners, with the majority of claims involving a cracked screen. According to the report, approximately a quarter of the broken glass claims involved the back screen. Apple has reportedly suspended sales of slide-on iPhone 4 cases at its stores because of potential scratches and cracks.